Some parts of present-day Uzbekistan have been inhabited since the Paleolithic era. The first states in the region were Khwarazm, Bactria, Sogdiana, and the Parthian Empire, in the first millennium BC . The territory was consolidated under the Achaemenids in the 6th century BC , until it was conquered by Alexander the Great, 329–327 BC . The Greeks were displaced by the Tochari in the 3rd century BC . From the 1st century BC to the 4th century AD Uzbekistan was part of the Kushana Kingdom. This in turn was replaced by the Ephthalite state. In the 6th century the area was part of the West Turkic Kaganate, a loose confederation of largely nomadic tribes. By the 8th century the region was conquered by the Arabs, who introduced Islam. The Ummayid dynasty was displaced by the Abbasids in 747–750. 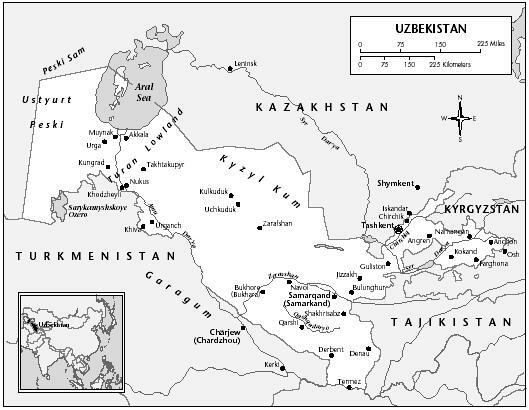 In the 9th century the Samanids took control of most of Central Asia, including Uzbekistan. Turkic tribes again began to push into the area from the east in the 10th century, eventually forming the Karakhanid state. A lesser part of that state, Khwarazm, grew more powerful in the 12th century and came to dominate most of Central Asia. Genghiz Khan's Mongols invaded in 1219, conquering all of Central Asia by 1221. In 1224 Genghiz Khan's son Chagatai was made ruler of this area. As Chingisid influence waned, Timur (Tamerlane, 1336–1405) established an empire in Samarkand. Upon his death it split into Khorasan, ruled by his son Shah Rukh, and Maweranahr, ruled by his grandson, Ulgh Beg. Although Timur is now claimed as the father of the modern Uzbeks, more likely candidates are the Sheibanid, nomadic Uzbeks who fought to take the area in the early 16th century. They settled among the other populations and became farmers, making Bukhara their capital. In the 16th century Khwarazm, Balkh, and Khiva separated from Bukhara, becoming separate principalities. Bukhara was conquered by Persia in 1740, but sovereignty was retaken soon after by the Mangyt dynasty, which ruled until 1920. In the early 19th century the Kokand Khanate grew powerful in the eastern part of present-day Uzbekistan. Russia had begun trading with Bukhara, Khiva, and Kokand in the 18th century. Concern about British expansion in India and Afghanistan led eventually to Russian conquest, which began in the 1860s and ended in the 1880s, when Uzbekistan became part of Turkestan guberniia, with Bukhara and Khiva administered as separate emirates under Russian protection. In 1916 Tsar Nicholas II issued a call for Central Asian males to be drafted into labor battalions. This sparked resistance throughout the region, including in Uzbekistan, which was violently repressed. During the conflict from 1917–1920, Uzbekistan was the site of competing attempts to create governments; the Bolsheviks announced a short-lived Turkestan Autonomous Republic, while a Muslim Congress also attempted an Autonomous Government of Turkestan. Red Army forces intervened savagely, but armed resistance continued as late as 1924, in the so-called Basmachi Rebellion. The Uzbek Soviet Socialist Republic was created in 1925. In 1929, Tajikistan, which had been an administrative sub-unit, was elevated to full republic status, changing the boundaries. They were changed once again in 1936. Under the leadership of long-time leader S. Rashidov, Uzbekistan was politically conservative during the 1970s and early 1980s. The republic was targeted for anti-corruption purges in the mid-1980s, when considerable fraud in the cotton industry was discovered. The leader as of 2003, Islam Karimov, was appointed by Moscow in 1989. LOCATION: 41°0′ N ; 64°0′ E. BOUNDARY LENGTHS: Afghanistan, 137 kilometers (85 miles); Kazakhstan, 2,203 kilometers (1,369 miles); Kyrgyzstan, 1,099 kilometers (683 miles); Tajikistan, 1,161 kilometers (722 miles); Turkmenistan, 1,621 kilometers (1,007 miles). independence on 1 September 1991, in the aftermath of the abortive Moscow coup of 19–21 August. Karimov's presidency was reaffirmed in an election in December 1991. Since then, however, Karimov has been increasingly hostile to even the most basic tenets of democracy. True opposition parties were banned in 1992 and political reformers have been jailed or have fled the country. Parliamentary elections to the 250-seat Majlis were held on 24 December 1994 and 15 January 1995, with 231 seats going to Karimov's People's Democratic Party—the former Uzbek Communist Party. Following the elections, President Karimov held a referendum that extended his presidency until 2000. Despite his anti-democratic leanings, Karimov received little criticism from the West or from Russia (which, in fact, supplies him with ample military backing) since he had been seen as a buffer against the fundamentalist Muslim political and revolutionary movements in Central Asia—notably those in Afghanistan and in neighboring Tajikistan. In fact, Uzbekistan had supplied arms to the secular factions in both countries' civil wars. The Islamic Movement of Uzbekistan (IMU), a radical Islamic organization seeking to establish an Islamic state in Central Asia, has long been operational in Uzbekistan. In February 1999, five car bombs in Tashkent were attributed to the IMU by Karimov, who accused the group of attempting to assassinate him and destabilize the country. The IMU broadcast a declaration of jihad from a radio station in Iran, and demanded the resignation of the Uzbek leadership. That year, IMU fighters operating from mountain hideouts launched a several-year series of engagements with government forces. Militants also took foreigners hostage in 1999 and 2000, including four US citizens who were mountain climbing in August 2000, and four Japanese geologists and eight Kyrgyzstani soldiers in August 1999. IMU military leader Juma Namangani apparently was killed during a US-led air strike in Afghanistan in November 2001. In addition to the IMU, the Hizb-ut-Tahrir ("Freedom Party"), another radical Islamic organization, operates in the country, although, unlike the IMU, it does not use violent tactics to pursue its goals. Following the 11 September 2001 terrorist attacks on the United States, and its subsequent military campaign in Afghanistan to oust the Taliban regime and al-Qaeda forces, all radical Islamic groups in the Central Asian nations were linked by most governments to terrorism. Uzbekistan offered its airbases to the US-led coalition for its campaign in Afghanistan beginning in October 2001. In response, the United States provided the country with $60 million for 2002, in addition to a one-time contribution of $100 million. On 27 January 2002, Karimov held another referendum to prolong his presidential term from 5 to 7 years, effectively keeping himself in power until 2007. The US Department of State refused to send election observers, arguing there had to be a "free and fair" presidential election before a referendum was valid.